Fraiture, M. and Brunner, F. (2014). Axenic Culture of Sclerotinia sclerotiorum and Preparation of Sclerotinia Culture Filtrate Elicitor 1 (SCFE1)-containing Fractions, Triggering Immune Responses in Arabidopsis thaliana. Bio-protocol 4(17): e1232. DOI: 10.21769/BioProtoc.1232. The necrotrophic white mold fungus Sclerotinia sclerotiorum (S. sclerotiorum) is pathogenic to a broad range of plant species, including the Brassicaceae model plant Arabidopsis thaliana (Boland and Hall, 1994; Bolton et al., 2006). In Arabidopsis thaliana (A. thaliana), the semi-purified proteinaceous S. sclerotinorum elicitor SCFE1 (Sclerotinia culture filtrate elicitor 1) is sensed at the plasma membrane by the receptor-like protein RLP30 and triggers strong immune responses (Zhang et al., 2013), similar to the bacterial elicitor flagellin (Felix et al., 1999). Elicitation of plant defenses with SCFE1 is a tool to dissect the signaling pathway involving RLP30 and to study immunity to necrotrophic fungi. Here, we describe a simple protocol to axenically grow S. sclerotiorum. Further, we present a two-step liquid chromatography-based method for the partial purification of SCFE1 from culture filtrate (Figure 1A-B). Measurement by gas chromatography of the emission of the plant stress hormone ethylene is proposed as a bioassay to monitor elicitor activity in the fractions throughout the purification procedure (Figure 1C). Figure 1. Two-step chromatographic fractionation of S. sclerotiorum culture filtrate to obtain semi-purified SCFE1. A. Purification scheme of SCFE1. Crude filtrate (CF) is loaded onto a Sepharose SP cation exchange chromatography column. The eluate (S1) is diluted 10-fold and loaded onto a Source 15S cation exchange chromatography column. Elution is performed with a linear gradient of 0 to 0.3 M KCl and elution fractions of 0.5 ml (F1 - F100) are collected. FT = flow-through. B. Chromatogram of the SCFE1-containing fractions eluted from a Source 15S cation exchange chromatography column. The black line represents the protein elution profile monitored with OD280 nm. The grey line shows the increasing conductivity of the elution buffer. ma.u. = milli-arbitrary units. mS = milli-Siemens. 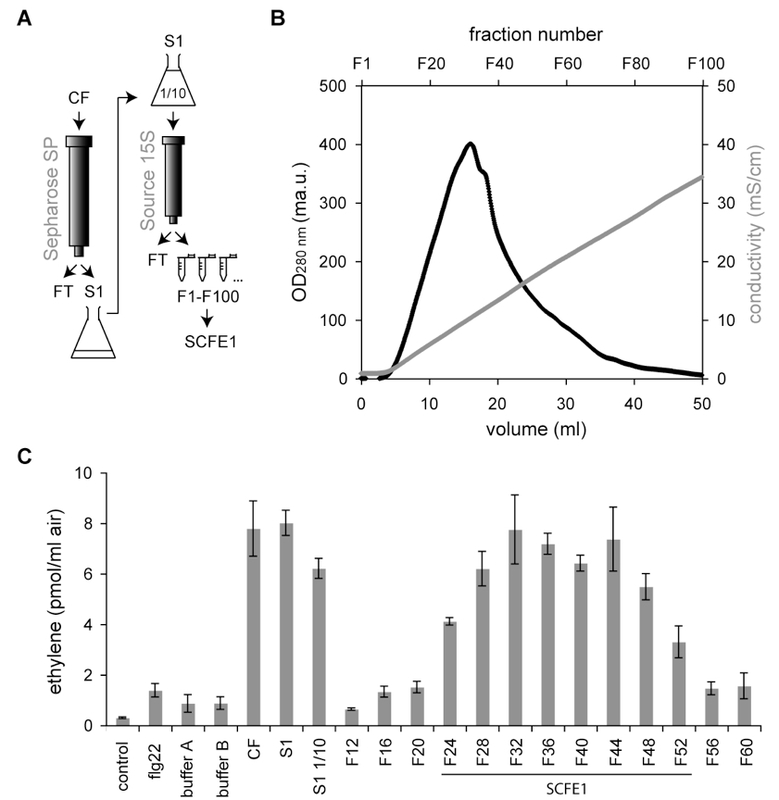 C. Ethylene response in Arabidopsis Col-0 to SCFE1-containing fractions obtained by two-step cation exchange chromatography. Arabidopsis Col-0 leaf pieces are treated with 15 µl CF, undiluted and 10-fold diluted S1 as well as the Source 15S elution fractions (Fx). Treatment with 0.5 µM flg22 is used as a positive control for ethylene production. No treatment and treatment with 15 µl buffers A and B are used as negative controls. In this representative purification, SCFE1 is contained in fractions F24 to F52. Bars represent average values (n=2) ± S.D. 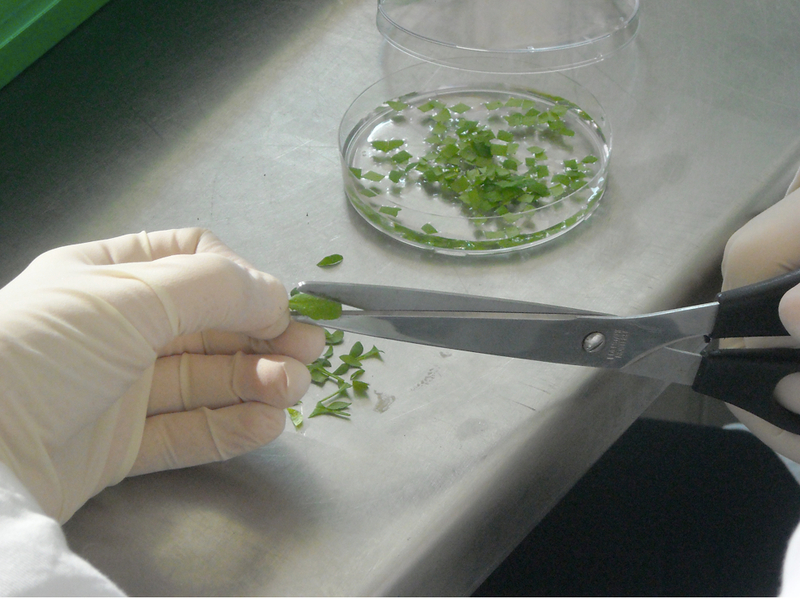 Work under sterile conditions when handling S. sclerotiorum cultures. Cut 2 agar plugs (0.5 x 0.5 cm) from the initial S. sclerotiorum-containing culture tube using a lancet. Place agar plugs in a Petri dish on malt-peptone-agar. Seal the plate with paraffin film. Let the fungus grow for 3 days at room temperature (RT) in the dark (Figure 2). Note: The mycelium should cover almost the whole surface of the plate. Store plate at 15 °C in the dark and reuse it for up to 3 months. Prepare 1 L culture flasks containing 400 ml malt-peptone medium (25 flasks for 10 L culture). 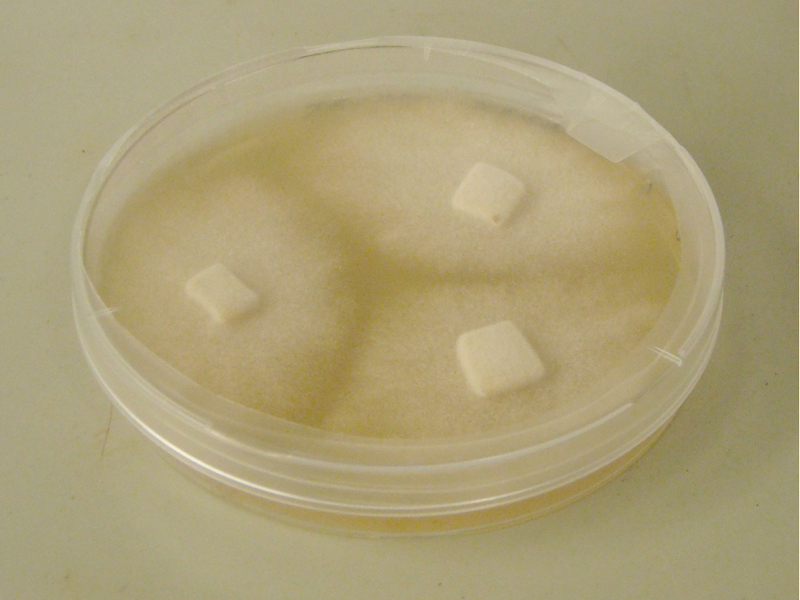 Cut agar plugs (0.5 x 0.5 cm) of fresh mycelium from the stock plate and inoculate each flask with 2 of them. Let fungus grow without shaking for 2-3 weeks at RT in the dark until the liquid surface is completely covered with mycelium. Put a nylon mesh into a laboratory funnel. Filter the culture medium through the mesh and collect it. Poor the culture filtrate into basins and freeze-dry it in a front-loading lyophilizer for 3 to 4 days. Store freeze-dried material at RT in a hermetically closed 1 L laboratory bottle. Add a silica gel bag to keep the material dry. Re-suspend freeze-dried culture filtrate (e.g. 15 g dry weight) in a minimal volume (approx. 6 ml/g) of ice-cold buffer A in a 50 ml Falcon conical centrifuge tube. Centrifuge sample for 20 min at 10,000 x g and 4 °C. Collect the supernatant and keep on ice. Repeat steps C9-10 if necessary to remove all insoluble particles. Keep an aliquot of culture filtrate for subsequent activity assays in plants. Re-suspended culture filtrate may be stored at -20 °C. Note: Frozen concentrated culture filtrate is stable for at least one year. Repeated freeze-thaw cycles do not damage the sample. For the isolation of SCFE1 from re-suspended culture filtrate, work with the ÄKTA Explorer liquid chromatography system cooled at 4 °C (in a cold lab chamber or cold room). All solutions for the chromatography should be prepared with ultrapure H2O, filtered through a bottle-top filter into clean, dust-free bottles and cooled at 4 °C. Pack a XK16/20 chromatography column from GE Healthcare with Sepharose SP Fast Flow matrix from GE Healthcare for cation exchange chromatography to around 15 ml column volume (CV). Note: For a small-scale purification (less than 5 g dry weight), 1 or 5 ml pre-packed Sepharose SP Fast Flow columns from GE Healthcare may be used. Wash column with 5 CV ultrapure H2O at a flow rate of 3 ml/min. Equilibrate column with 5 CV buffer A at a flow rate of 3 ml/min. Load re-suspended culture filtrate via the P-960 sample pump at a flow rate of 3 ml/min. Register flow, pressure, pH, conductivity, OD280 nm and OD215 nm during the run. Collect flow-through once OD280 nm increases and until loading is completed. Wash column with buffer A until OD280 nm and OD215 nm are back to the base line and stable. Elute in one step with 100% buffer B. Collect eluate into a 50 ml Falcon conical centrifuge tube using rack A for the fraction collector. Start collecting once OD280 nm exceeds 300 ma.u. (milli-arbitrary units) and stop when the end of the elution peak is reached. Wash column subsequently with 5 CV 2 M KCl, 5 CV ultrapure H2O, then 2 CV 20% ethanol for storage. Before proceeding to the second purification step, test activity of culture filtrate (CF), flow-through (FT) and eluate (S1) with the ethylene assay in Arabidopsis (see step F). Note: S1 should have the highest activity and contain most of SCFE1. Store S1 at 4 °C until next day or at -20 °C for more than 1 year. The flow-through may be discarded if the activity is successfully recovered in S1. Dilute S1 10-fold with buffer A. Install a pre-packed Source 15S 4.6/100 PE column from GE Healthcare for cation exchange chromatography. Wash column with 5 CV ultrapure H2O at a flow rate of 1ml/min. Equilibrate column with 5 CV buffer A at a flow rate of 1 ml/min. Load total volume of diluted sample via the P-960 sample pump at a flow rate of 1 ml/min. Note: The pressure on the column increases with time. The flow rate may be reduced progressively. Elute with a linear gradient from 0% to 60% buffer B in 40 CV at a flow rate of 0.5 to 1 ml/min (see Figure 1B for a typical elution profile). Collect 0.5 ml fractions in 1.5 ml reaction tubes using rack B for the fraction collector (approx. 100 fractions, labeled F1-F100). Create a program for automated fractionation with the method wizard of the Unicorn software. Note: SCFE1 should elute at a salt conductivity value between 8 and 16 mS/cm. Wash column with 5 CV 100% buffer B at a flow rate of 1 ml/min. Note: A small elution peak may appear. It does not need to be collected, as it does not contain any activity. Wash column with 5 CV water, then 2 CV 20% ethanol for storage. Note: If the pressure on the column remains higher than initially, it means that it was slightly clogged during sample loading and requires additional washing before reuse. In this case, follow the cleaning-in-place (CIP) procedure for Source 15S columns as described by the manufacturer. Test activity of flow-through (FT) and elution fractions (F1-F100) with the ethylene assay in Arabidopsis (see step F). Note: It is sufficient to test 1 fraction out of 5 for those with low OD280 nm and 1 fraction out of 2 for those corresponding to the elution peak. Store active fractions containing semi-purified SCFE1 at 4 °C for maximum 1 day or at -20 °C for more than 1 year. The flow-through may be discarded if the activity is successfully recovered in the elution fractions. Grow Arabidopsis Col-0 plants on soil (GS90/vermiculite mixture 3.5: 1) for 5 to 6 weeks in a growth chamber: 8 h light/16 h dark, 23 °C, 40–60% relative humidity, 100 µmol m-2 s-1 light intensity (short day conditions). Choose the biggest leaves from the plants. Cut each leaf into 6 rectangular pieces using paper scissors. Omit the edges, tip and stalk. Float leaf pieces on dH2O in a Petri dish (Figure 3). Note: Prepare the leaf pieces 12 to 20 h before elicitation. Leaf pieces left for a longer time will not respond well to elicitation anymore. Leave leaf pieces over night in the closed Petri dish at RT or in an air-conditioned room. Pipet 0.5 ml dH2O into glass test tubes. Use 2 or 3 tubes per sample to test (for duplicate or triplicate measurements). Put 3 leaf pieces into each test tube using a spatula. Note: Leaf pieces may rest for a few hours in the test tubes or may be elicited immediately. Add 5 to 15 µl of the samples to test (CF, FT, S1 and/or selected fractions of F1-F100). Include an untreated control and a positive control (5 µl of 50 µM flg22 = 0.5 µM final concentration). Close test tubes with rubber stopper and carefully shake tube rack to mix. Note: Leaves should stay in the water or on the surface but not stick to the glass. Incubate for 3 to 4 h at RT. Prick through the rubber stopper of a tube using a 1 ml syringe with a needle. Mix the air inside the tube by moving up and down several times. Withdraw 1 ml air and inject it into the gas chromatograph. Record retention time and peak area to determine the amount of ethylene in pmol/ml air (see Figure 1C for representative data sets). Note: For the untreated control, an average value of 0.60 +/- 0.21 pmol/ml air is expected. The mean values for buffer A and B are 0.81 +/- 0.23 and 0.81 +/- 0.23, respectively. With 1.30 +/- 0.20 pmol/ml, the ethylene production in the flg22 control is expected to be around 2x higher than in the non-treated and 1.5x higher than in the buffer controls. The values for culture filtrate (CF) can range from 2.5 to 15 pmol/ml. As culture filtrate yields a higher ethylene response than flg22, an active culture filtrate sample from a previous purification (stored at -20 °C) may be used as additional positive control. The ethylene assay is a very reliable and fast method to detect and quantify the immune-eliciting activity of the SCFE1-containing fractions. It also allows testing a large number of samples in a row. Other immune assays may however be used, such as the luminol-based oxidative burst assay to measure the production of reactive oxygen species (requires dialysis of the SCFE1-containing fractions to remove buffer), immunoblotting to detect activated MAP kinases or qRT-PCR for transcriptional profiling of defense-related genes (Zhang et al., 2013). To confirm that in the selected chromatographic fractions truly contain SCFE1 and no other or additional elicitor, the fractions may be tested on the Arabidopsis RLP30 knock-out mutants rlp30-1, -2 or -4. These mutants are completely insensitive to treatment with SCFE1-containing fractions, but react normally to flg22 challenge. Alternatively proteinase K sensitivity and heat stability of the immune-eliciting activity are good indicators for the identity of SCFE1 (Zhang et al., 2013). We acknowledge Prof. Georg Felix and his group at the ZMBP for having established gas chromatography and the ethylene assay protocol in the research department. Boland, G. and Hall, R. (1994). Index of plant hosts of Sclerotinia sclerotiorum. Canadian J Plant Pathol 16(2): 93-108. Bolton, M. D., Thomma, B. P. and Nelson, B. D. (2006). Sclerotinia sclerotiorum (Lib.) de Bary: biology and molecular traits of a cosmopolitan pathogen. Mol Plant Pathol 7(1): 1-16. Felix, G., Duran, J. D., Volko, S. and Boller, T. (1999). Plants have a sensitive perception system for the most conserved domain of bacterial flagellin. Plant J 18(3): 265-276. Zhang, W., Fraiture, M., Kolb, D., Löffelhardt, B., Desaki, Y., Boutrot, F. F., Tor, M., Zipfel, C., Gust, A. A. and Brunner, F. (2013). Arabidopsis receptor-like protein30 and receptor-like kinase suppressor of BIR1-1/EVERSHED mediate innate immunity to necrotrophic fungi. Plant Cell 25(10): 4227-4241. How to cite: Fraiture, M. and Brunner, F. (2014). Axenic Culture of Sclerotinia sclerotiorum and Preparation of Sclerotinia Culture Filtrate Elicitor 1 (SCFE1)-containing Fractions, Triggering Immune Responses in Arabidopsis thaliana. Bio-protocol 4(17): e1232. DOI: 10.21769/BioProtoc.1232.